Prestigious villas featuring contemporary design, luxury finishing, a magnificent lake view and a private pool in the sunniest and most exclusive area in Cernobbio. On the western bank of lake Como, the nice town of Cernobbio takes its name after an ancient coenobium, a medieval convent where manual work and prayers used to rule the community life and the daily routine of the nuns in the historic building occupied nowadays by the famous and luxurious Villa d’Este hotel. 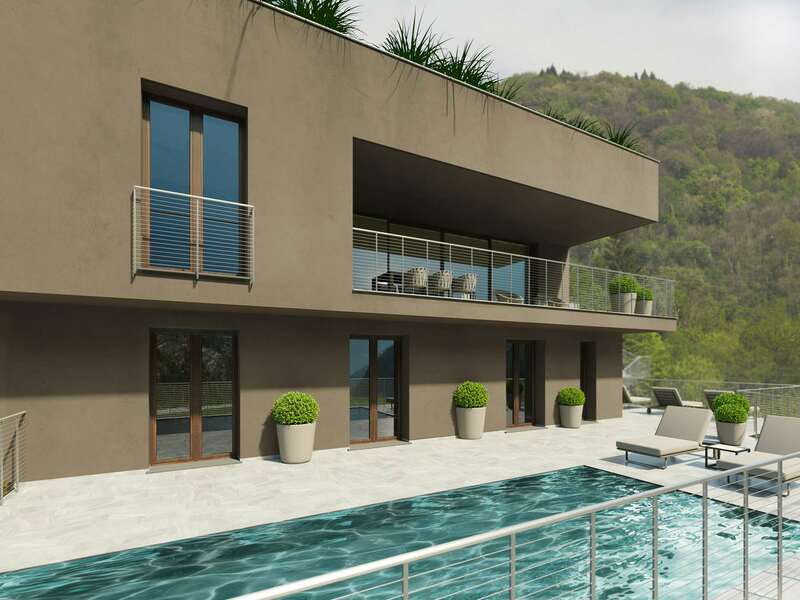 On the mild cliffs of a hill overlooking lake Lario, in the sunniest and most panoramic area of the village, GH Luxury Estate proposes four villas for sale under final completion, all featuring a magnificent lake view and a gorgeous sun exposure which grants their rooms a full brightness all day long. Each villa has got a private swimming pool and a private garden of approx 1,000 sqm conceived in full harmony with the local ground profile and finely planted with evergreen trees and shrubs. All villas have been designed according to a contemporary and functional concept, and all of them feature huge floor-to-ceiling windows to prize the magnificent lake view and the bright natural light. All of them are equipped with state-of-the-art home automation systems and luxury finishing and enjoys vegetation roof-coverings to grant a perfect thermal insulation with a gentle and friendly landscape impact. The dining&living area in each villa has been conceived as a spacious and top-bright open space, where the lake view to be enjoyed is particularly noteworthy; each property offers different solutions in terms of bedrooms and bathrooms, but each of them can meet the requests of demanding homebuyers wishing to grant themselves and their guests privacy and independence as well as to lodge some household staff. All villas have got a huge garage where three cars can be parked; the two higher buildings do also feature a private lift to reach the villas from the garage downstairs. Each property is being finished with luxury materials and elegant details and constitutes the perfect living solution for selective buyers seeking for a property in an exclusive location where to enjoy a magnificent lake view and top modern comforts.